When IE ESC is enabled, you will get popups all the time and you are asked to add every new url to the Internet Explorer trusted sites zone. So, in development server or test server, it is desirable to disable it or turned off. 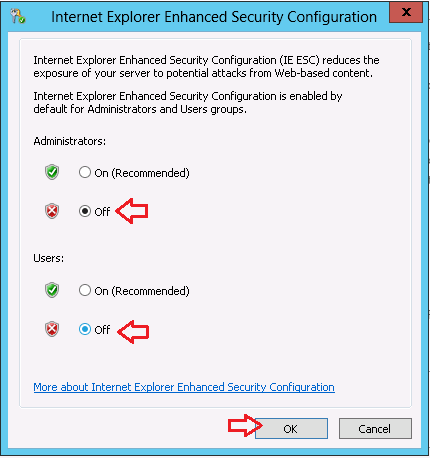 This is just a quick guide to disable or turn off IE Enhanced Security in Windows Server 2012. 1. Start the Server Manager from Windows 2012 desktop. 2. Select Local Server which shows the settings of the server you are currently on and the one that needs IE ESC turned off. 3. In right side of the Server Manager, you can find the IE Enhanced Security Configuration Setting. (The default value is On). 4. Click on the link On and turn off/disable IE Enhanced Security for Users and Administrators and click Ok.